If you look at the 'Newhaven, East Sussex' group of Flickr, you'll come across some great shots of the local area. Some of the group's members have given me permission to add them to Our Newhaven, and I'm starting with a great bit of nostalgia from Barry Lewis, AKA 'Sir Hectimere'. This was taken back on a calm, warm, sunny afternoon back in 1973. 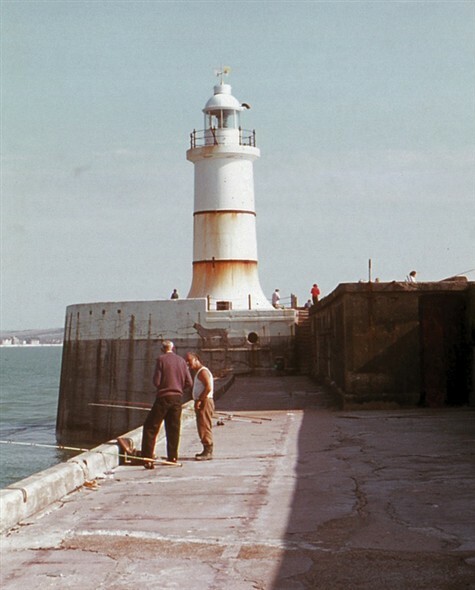 As you can see, in those days you could walk the entire length of the breakwater, right up to the lighthouse, and even walk back along the upper level - no handrails, but I can't remember hearing of anyone falling off! The fishermen are waiting to see if anything bites. I can remember doing just this, having first carefully dodged the British Railways man at the car park kiosk and saved the cost of the fishing ticket - what was it back then? 6d, or a shilling, maybe. I'll add some more Flickr shots over time. This page was added by Andy Gilbert on 20/02/2015. I remember walking the whole length of the breakwater, under the covered way with the arches all along it, one evening in about 1968, with massive waves crashing over the top. I had with me one of the prototype Ferguson cassette recorders, in a handmade perspex cabinet, and the recording I made, as I walked along, was amazing. Unfortunately, I don't still have it. I managed all of this WITHOUT FALLING IN, or coming to any harm whatsoever. Isn't it incredible, what we used to be able to achieve, before "health and safety" took over our lives? Part of growing up was walking under the arches during a storm and knowing when to jump up onto the small ledge at the base of the concrete pillars so you didn't get wet when the wave sluished over the top and temporarily put a foot and a half of water on the walkway, before it drained over the side. For those who haven't done it, there was a loud whump and then it went dark. It became even more interesting when there was a broken section of the outer wall halfway down the length of the breakwater. You really had to have your timing down then. Happy days.